Lawn care and maintenance include maintaining your equipment in good working order. Therefore if you have a bump feeder trimmer, you need to maintain it the right way by replacing the line when it gets brittle or when it runs out. You should always insert a new trimming line at the beginning of every season. The old line may be brittle due to being stored for a long period of time and may also have been used and worn out anyway during the last season. A brittle line is not strong and will keep breaking during trimming. A bump feed trimmer has a black and round cutting head with a spring knob at the center. Installing a line in a bump feed requires the cutting head to be dismantled carefully. Use either two pieces of .095 string trimmer line, or you can use a twin-strand split line. For more info about best .095 string trimmer line, click here. You need 10 feet of replacement line. Get a good working surface to work from and get a box where you can place the screw, string and other components of the trimmer. For a perfect replacement job, you need the line and a good cutting tool like snippers or pair of scissors. Carefully disassemble the cutting head by first unscrewing the bump knob, then remove the inner reel and spring. After dismantling, then remove the old line from the spool and dispose it off. Then clean your trimmer head by removing any debris that has collected in it over time. You begin installing the new line by cutting 10” of trimmer line. Pair together two pieces of replacement line or use a twin-strand split line. 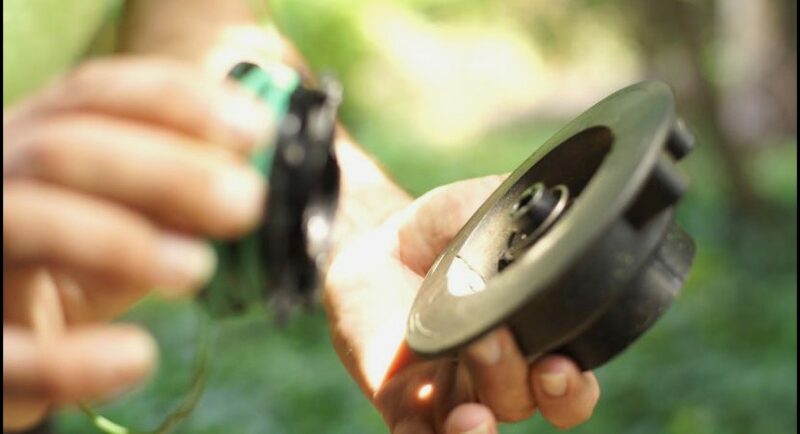 Insert the paired up line into the reel by inserting it into one of the holes. Pull the line until only 2 or 3 inches of the line has remained and place the remaining line into the second hole. Pull the line tightly to close the loop. This should hold the line securely to prevent it from spinning loosely inside the head. Wrap the line around the spool by following the directions on the reel. Look out for the arrows on the trimmer head. Ensure you are wrapping the line tightly to prevent poor advancing issues. Everything needs to be returned to its original position in the cutter head. That includes the string, reel, and bump knob. Therefore, when you are almost finished wrapping the line, and you have about six inches of line left, return the string where it was in the cutting head. Hold the string as you locate two eyelets (small holes) on the cutting head, opposite each other. One string should be inserted in one hole and another string into the other hole. Ensure the string stays in place by holding it all this time. Return the reel also back to its original position. Then return the bump knob by holding the reel down and pressing the spring. Tighten the bump knob by screwing it back. Now your bump feeder is fully reassembled with a new trimming line. Release the trimming line by gently pulling out the two lines. If your trimmer is electric, it is either an automatic feeder or a bump feed trimmer. Both machines operate the same in the fact that both an automatic feeder and a bump feeder rotate a string to trim down weeds. But they are different in how they feed the line. An automatic feeder is designed to advance the line automatically, while a bump feed requires you to monitor feeding of the line by tapping on the head on the ground when the line requires advancing. Therefore, the automatic feeder advances the line on its own and that’s why it is called automatic. It advances the line by releasing out more line whenever the string gets short. While the line on a bump feed trimmer is advanced manually. It operates using centrifugal force. The line is advanced by pressing the head of the trimmer gently against the ground or any flat surface. When the head is pressed, it places a force on the spring in the head of the trimmer. The force works to pull the string from the spool. To avoid your bump feeder from breaking down, when manually advancing the string, never push too hard. You do not want to damage the spring or crack the head. However, the string will over time wear out and need replacement.